Momence’s historic central business district was named to the National Register of Historical Places in 2006. This was an accomplishment of Main Street Momence. The district was recognized because of the large number of intact historic buildings, the wide variety of architectural styles, and the quality of several key buildings – First National Bank, the Momence State & Savings Bank, Parish Bank, the Jensen Drug Store building, and the Momence Theatre. The bank buildings were featured in the 2002 film “Road to Perdition”, starring Tom Hanks. This lavish mansion was built in 1892 by Axel Wikstrom, who was rumored to be of Swedish royalty. It served as a convent for many years, then as a lovely Bed & Breakfast, and is now a private home. 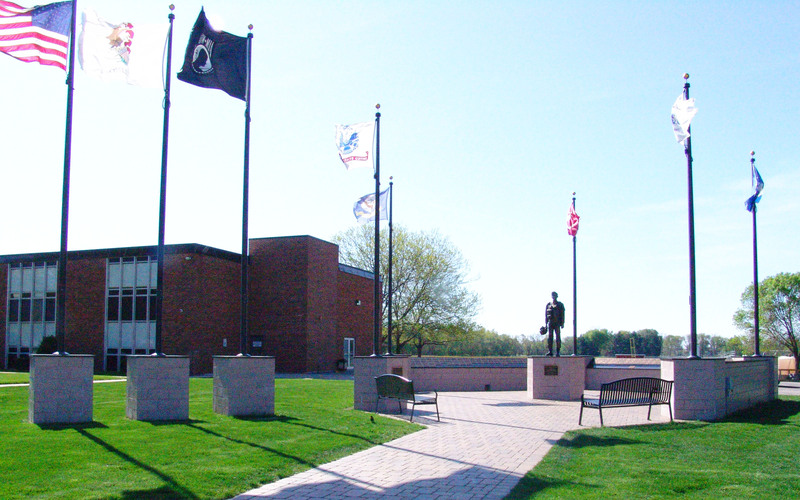 The 50 foot diameter memorial was dedicated on September 15, 2007, and it honors all Momence-area veterans. It includes the five flags representing each branch of the military. At the center of the octagon-shaped memorial is a life-sized bronze statue of Air Force Colonel Jim Kasler of Momence, who is the only three-time recipient of the Air Force Cross, the second highest award for wartime valor. Currently there are over 350 plaques displayed at the park. The memorial was placed near the schools to enable the Momence youth to learn about and remember the sacrifices of the hundreds of men and women from their community who served our nation. The following historical sites are generally only open during festivals and on some weekends. Plan to tour these facilities during one of Momence’s many annual festivals. This building served as a depot from 1890 to the 1950’s, and served the Chicago, Indiana & Southern Railroad and the New York Central lines. Excursions from towns west of Kankakee to St. Joseph, Indiana typically cost $1-$2. Bill and Phyllis Munyon fully restored the depot, and it currently houses a permanent display of railroad artifacts and military memorabilia. Depicting everyday life in the late 1880’s, this 1869 home features period furnishings throughout. It originally served as a private residence. The Momence Women’s Club was instrumental in preserving this lovely house museum. The home is maintained by the City of Momence. The arbor and gardens were created by the Momence High School Shop Class and Main Street Momence. After undergoing extensive renovations, the museum reopened to the public in December, 2014. Read more about it on their website. Built in 1853, moved to its current location, and originally called the Mount Airy School, this fully restored one-room school house is furnished with genuine artifacts and memorabilia typical of that era. For more information on "The Little Red Schoolhouse", visit the Graham Historic House and Museum website.